Originally when Josh got my camera, there became the issue of me not wanting to break it but also not wanting to carry the camera bag around. It wasn't that I didn't want the camera protected but I didn't want to scream "Hey, I'm carrying around a DSLR! Come mug me!" Within the last year, I did find a neoprene sleeve made by canon and now can carry my camera in any bag I want. It offers it enough protection for a safe little journey but not a huge adventure. Then a couple weeks back I found these amazing camera bags masquerading around as purses... stylish purses none the less. These bags are made by Epiphanie and are wonderful little totes. 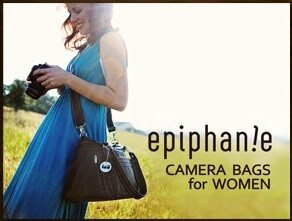 They have all the pockets and padding you could want for your camera but look like a tote. The pockets feature velcro to adjust to any size inside... just like any camera bag. The insides are light and bright so that you don't loose your SD cards and the outsides are made of durable faux leather. What more could you want? I know if I were planning/paying for my wedding, I would run out and snag one today! Anyone else as thrilled as I am about these?